Magic on Main Street: Natierra Goji Berries, Also, What's a Super Fruit? Natierra Goji Berries, Also, What's a Super Fruit? I was perusing Marshall's the other day (of course) when I got hungry, so I picked up a pouch of Natierra Yogurt Covered Goji Berries. They looked tasty and were on sale. Um, so good! They're both tasty and filling, which I really wasn't expecting. A small handful satisfied my snack cravings. The Goji berry has been a cherished fruit in Chinese and Tibetan medicines for centuries. No wonder it is called a Superfruit. This little red berry is actually filled with antioxidants, vitamins and minerals. When covered with calcium rich yogurt, it becomes even more delicious and enjoyable way to stay healthy. Hm. Interesting. What, pray tell, is a superfruit, and why should I want to eat it? Let's ask wikipedia! Superfruit, a marketing term first used in the food and beverage industry in 2005, refers to a fruit which combines exceptional nutrient richness and antioxidant quality with appealing taste that can stimulate and retain loyalty for consumer products. "Superfruit" has no official U.S. Food and Drug Administration (FDA) or U.S. Department of Agriculture (USDA) endorsement. Some popular fruits like bananas, pineapples, strawberries or oranges are not commonly mentioned as superfruits despite excellent nutritional properties, apparently because they have not been marketed specifically as superfruits. Marketing literature for wolfberry products including several "goji juices" suggest that wolfberry polysaccharides have biological effects and possible health benefits, although no such claims have been supported by peer-reviewed research or approved by any regulatory agency. A 2008 pilot study indicated that parametric data did not show significant differences between subjects receiving Lycium barbarum berry juice and subjects receiving a placebo; the authors, nevertheless, concluded that subjective measures had been affected. This study was subject to various criticisms concerning its experimental design and interpretations. Published studies have also reported biological effects of Lycium barbarum in animal models, and inferred from this basic research that there may be potential benefits against cardiovascular and inflammatory diseases, vision-related diseases (such as age-related macular degeneration and glaucoma) or from neuroprotective, anticancer or immunomodulatory activity. In Traditional Chinese Medicine, Lycium leaves may be used in a tea, together with the root bark (called dìgǔpí; 地 骨 皮). A glucopyranoside (namely (+)-Lyoniresinol-3α-O-β-d-glucopyranoside) and phenolic amides (dihydro-N-caffeoyltyramine, trans-N-feruloyloctopamine, trans-N-caffeoyltyramine and cis-N-caffeoyltyramine) isolated from wolfberry root bark have inhibitory activity in vitro against human pathogenic bacteria and fungi. Hm, so basically superfruit is a marketing term, but fruits themselves, including goji berries are still healthy for you. Additionally, according to modern medical studies there's no discernible proof that goji berries have any medicinal effect, but parts of the goji plant are used in traditional medicines, which as we all know tend to be the building blocks for modern medicines and antibiotics. Are Natierra Yogurt Covered Goji Berries healthy? Debatable. 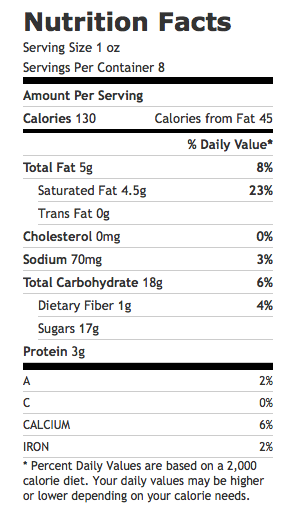 Although they are high in protein, they're also pretty high in saturated fat and have added sugar - 17g per serving. So while it's not the worst thing you could eat, I probably wouldn't chomp down on them with abandon and would suggest mixing them in with granola or museli (Oo, museli, fruit, a few yogurt covered goji berries and greek yogurt sounds like an awesome breakfast). I'd say it probably the same "health" benefit as eating any yogurt covered fruit that you've made yourself. HOWEVER, I'd also say that since I can pronounce and recognize all the ingredients, it's definitely more "natural" than most yogurt covered fruit snacks you can pick up in the store. Natierra is clearly labeled no GMO, but I wonder if it's organic or their yogurt is RBGH free? They import many of their products and I wonder what their business ethics/conditions/etc are? Their website does not have the answer to these questions, but it does suggest that I might also like their Dark Chocolate Covered Goji Berries, and I'm thinking they're probably right. Pomegranate, Acai berries, Mangosteen, Goji, Noni, Baobab, Elderberry, Lingon Berry, Sea Buckthorn, Maqui Berry, Blood Oranges and Black Currants. Grape, Kiwi, Banana, Strawberry, Apple, Cranberry, Blueberry, Oranges, Red Raspberries, Pineapples, Tomatoes and Blackberries. Goji Berries are big fun. I love adding them to all kinds of things. I even have a little bowl of them just sitting on the counter next to a bowl of raw cacao nibs and hemp seeds - all for quick snacking.